As a young girl, I remember how close to the surface my emotions always seemed to run. I was so captivated by the possibility each moment contained that I would move from sadness to joy within what felt like seconds. Today that might be considered a diagnosable disorder, but for anyone who has been a child, we know it is a normal part of growing up and falling wildly, rapturously in love with the world. The gift of an unburdened view of everything that surrounded me felt like I was constantly reaching into a field of pure potential and creating the world anew over and over again. One moment I was on the ground crying hot tears, having fallen off my bike and the next moment I would stare in curious wonder at the ants as they carried a morsel of food 50 times their body weight back to their home. Another moment I was weeping on the stairs as I dragged my bag behind me, shouting down to my mother that I was going to run away from home, because she was so mean and the next, I was contently wrapped in her arms as she whispered her gratitude that I decided to stay. Back then I lived unfettered by the sometimes-jaded cynicism of my elders, particularly my mother and her friends. My mother’s frequent refrain that “people are stupid” didn’t really seem to sink in or mar my love affair with those very same people to whom she directed her criticism, the people I met everyday on my adventures with my bicycle, the people who seemed to love me in return, which was enough for me. It was plenty. Puberty: a time when the lustrous shine wears off the world and its hardness peeks out from underneath the naïve cover of our youth. For me, the start of puberty was also a time of deep unrest for my mother. She and my father had divorced after having been separated for nearly 10 years and she was ready to leave this too-small town and set off on her own grand adventures to see the world. So she sold our house. Planned a 6-month trip for us to Europe (as one does), where, upon our return we would move to Maine, a long-time dream of hers. She was excited, filled with joy. But her joy was my sorrow. My town was the perfect size for me. Regardless, it seemed that my life had something bigger planned. It was a hard time for me, as adolescence seems to be for so many of us and it felt like sorrow and joy were the tide: They were uncontrollable and would wash in and out without command or concern. In fact it still feels that way: Sorrow comes in and joy washes out. Joy comes in and sorrow washes out. The truth is that the emotions and experiences of life have continually been washing over each of us, even as a young children. However during adolescence— a time of deep personal, emotional, and spiritual growth—the strength of those waves can seem too strong and too frequent, almost as if we are caught in an undertow, keeping us drowning at sea. As a child, I was able to float from moment to moment, keenly focused on the breathtaking beauty of the world; as an adolescent I seemed to get bogged down in the sadness of it: Sorrow washed in and seemed to stay on the shore more often than joy. I was depressed. I felt lonely. I felt the world was cruel and unfair. My father didn’t love me. My sister didn’t understand me. The small things that had once fascinated me as a girl no longer held their luster. Where once I had looked down at the ground to avoid stepping on the ants, now I was focused on the horizon of when I’d be older and able to get out, move on, fall in love, get married and be in charge of my own life. 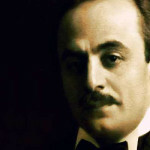 I can see now that, as Khalil Gibran shared in his writing, this period in my life—this period in all of our lives—is vitally important. The tidal strength of sorrow was carving a well deep into my being, creating a place to contain more joy. And as I’ve grown, thankfully moving out of my teens and my twenties—as I have become that woman that I so desperately wanted to be as a girl—the tide has washed away that seemingly constant layer of sorrow and has uncovered a new layer of joy. I am once again fascinated by the mightiness of the tiniest creatures on earth. I find myself smiling at the simple breeze that catches my hair and cools my skin. I feel my eyes prick with tears when I see the sweetness of a child shrieking in the ecstasy of ordinary life. As I’ve gotten older—as the tides of my life have washed in and out, sorrow depositing wisdom on my shores and joy taking the decay of sadness away—I am struck at how the quality of joy and sorrow is now, at once, both completely different and yet wholly the same as it was when I was a child. There is less urgency now. It seems that the deep grooves left in me by the hardness of my adolescence have made it so that I now able to hold two truths within me at once: Even in sorrow, I can recall the joy and even in joy, I can feel the sorrow. It seems that the hardness of life has made space for love to not only enter, but to stay in me more often and more fully. That is the basic element of life that I didn’t recognize as being vitally important for my happiness as a child or adolescent: the element of love. Just as the moon influences the tide, our lives are influenced by the gravitational pull of love, which orbits each of us. As love orbits our life, like in the phases of the moon, we are sorrowful when we cannot see it and joyful upon its return. As an adolescent, heck, as an adult, I didn’t believe there was enough love for me. I was greedy for it and when it moved out of my vision, I thought it was gone, never to be felt nor experienced again. But now, unlike when I was a child, I know then even when the moon isn’t visible in the night sky, it is still there, slowly making its way round the earth, both predictable and surprising in its magical journey. The same is true for love. When sorrow washes in once again and we are left grieving for a joy that is no longer with us, even in our darkest hour, we know that, if we sit long enough in the memory of love, it will come back around to illuminate our lives once again. And if today you find yourself feeling sadness or melancholy—if you sit here in your seat grieving for something or someone you have lost— know that soon joy will come to unmask your sorrow. Just as a full moon returns to the night sky every 29.53 days, joy is on its way back to you and with it will come a love that is so bright and full, that it will light up the dark night of your soul with its brilliance and make the stars shimmer with envy. This reflection was originally written and delivered by Jessica Steward at the Portland New Church, 302 Stevens Avenue, Portland, Maine on Sunday, May 17th. 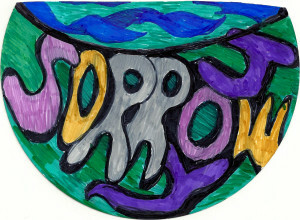 The service, “Joy as Sorrow Unmasked,” was designed by Jessica Steward, Karen Orr, and Leslie Hyde, all students at the Chaplaincy Institute of Maine.